When you were 5 years old how much do think you understood about yourself? You probably had a favorite color. Maybe even a favorite animal. Apart from your likes and dislikes though, how much did you really understand about you? We think it’s fair to say that a large part of preparing children for the world means helping them understand who they are. With that in mind, the theme for our first unit in Kindergarten is “What Makes Us Unique.” Over the course of several weeks, scholars spend time identifying the things that make them special and different from one another. 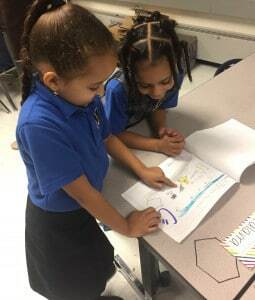 As part of this unit scholars read a book called Nappy Hair. It’s a story about a young girl who is teased about her hair at a family picnic. The tale focuses on what it means to have pride in one’s self and embrace the things that make you who you are. While reading the book scholars at Elementary School 3 spent a week drawing and labeling their own hair. They then took part in guided discussions to talk about words that could be used to describe hair, made connections with others who had similar hair, and recognized that there were types different from their own. At the end of the week, scholars gathered the work they had done into books and held a gallery walk in their classroom. This closing activity provided scholars with the opportunity to showcase the work they had done. 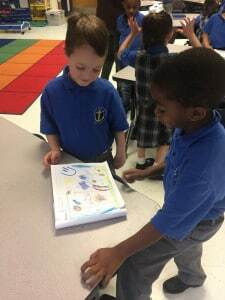 It also provided them with the opportunity to learn from others by talking to their peers about their books and asking questions about the traits that make them unique. Our scholars, as so many of us have, could spend a lifetime exploring who they are and learning about others. To do our part in supporting scholars on their way to becoming well-rounded, self-aware, and culturally competent adults, we have prioritized books like Nappy Hair that provide us with age-appropriate entry points for discussions around culture. From elementary through high school our teachers do an amazing job delivering culturally responsive lessons like this one and guiding scholars through the deep conversations that often result. These conversations give our scholars the skills they need to articulate what makes them wonderfully unique as well as how to have an appreciation for the things that make others equally special. So, while the “What Makes Us Unique” unit is the first phase of self-exploration we support our scholars through, it’s certainly not the last. The conversations started here will stretch through high school. So, until graduation day, we’ll be here ready to continue the discussion.